Two captured Syrian military officers are begging President Bashar al-Assad to help free them from rebels. On Tuesday, a video was posted online purportedly showing the two men, who said they were abducted last October by the Free Syrian Army, a loosely organized group of Syrians who have been fighting for nearly two years to oust al-Assad. In the video, Staff Brigadier Hussein Allouch, an engineer from the Armored Vehicles Department, and Gen. Brig. Ahmed Raeidi are shown begging al-Assad — a fellow Alawite — to help them. The Syrian government has been involved in prisoner swaps recently, with the international community and both fighting groups giving opinions as to whether these arguable concessions from al-Assad indicate his power is weakening. Last week, 48 Iranians held hostage by Syrian rebels for five months arrived at a Damascus hotel after they were freed in a prisoner swap for more than 2,000 regime prisoners. The video is one of many on YouTube and elsewhere on the Web showing the war in Syria — images placed there to tell the world what’s happening, since the Syrian government rarely allows international journalists to officially report from inside the country. Since the uprising, partly inspired by the region’s Arab Spring, began in March 2011, al-Assad claimed that “terrorists” were causing violence in Syria and his government had a right to fight back. FSA says al-Assad is responsible for oppressing the country for years, and recently killing scores of innocent Syrians to maintain power. While the officers were begging for their freedom, other Syrians were dying. At least 50 people were killed across Syria Tuesday, including seven children, according to the Local Coordination Committees of Syria, which keeps track of daily death tolls. At least 15 people were killed in a pair of blasts that rocked Aleppo University Tuesday, the opposition Syrian Observatory for Human Rights said. State-run media blamed “terrorists” for the explosions, referring to the rebels. The deaths came on the first day of exams at the university. But it was regime warplanes that shelled the university, said Abdulla Yasin, a spokesman for the Free Syrian Army. The rebels had no presence near the campus, which is located in an area controlled by the government, he said. In addition to students, families displaced by fighting in Aleppo, Homs and Hama are staying at the university dorms that suffered the brunt of Tuesday’s attack. In recent days, the city of Homs was shelled ferociously. The al-Assad regime hit the city three times, firing artillery on the neighborhood of Jobar, killing and injuring dozens of people, rebels said. In Houla, at least 15 were killed — including eight children — as regime shelling rocked the city, rebels said. Tank shelling on the Homs-Tartour Highway was captured on video. Houla is known for a May 2012 massacre in which at least 100 Syrian civilians, many of them children, were killed. The incident sparked international outrage. In Damascus, the seat of al-Assad’s power, the Syrian Air Force continued its intense assault on the capital. Air raids throughout the city continued Tuesday while regime forces set up earthen mounds for defense. They also burned down houses near the Mazeh Military Airport, rebels said. A government jetfighter shelled the eastern Ghouta neighborhood of Damascus, an assault that was videotaped and posted on the Web. Brahimi’s “assessment of the political situation in Syria” is “short sighted,” the piece said. While railing against Brahimi reached a fever pitch inside Syria, France’s Ministry of Foreign Affairs sent a letter to the United Nations Security Council. The missive, signed by 55 countries representing regions worldwide, appealed to the Security Council to make a commitment to act aggressively in opposing the actions of al-Assad’s regime. 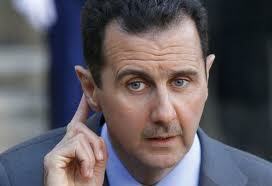 The letter urged that the International Criminal Court pursue action against the Syrian president. Earlier, a United Nations-based independent international Commission of Inquiry found evidence of crimes against humanity and war crimes in Syria. The United Nations High Commissioner for Human Rights has also repeatedly called for the Security Council to refer the situation in Syria to the ICC.